What would have made The Golem of Hollywood better? I don't care for mystical happenings, and this book's attempt at a conclusion relies on such beliefs. 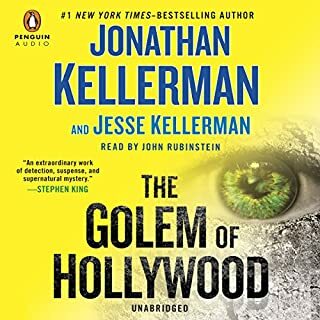 Would you recommend The Golem of Hollywood to your friends? Why or why not? NOT AT ALL. I don't know anyone that wants to read about a 500 year old bug that can morph into a seductively beautiful (& naked) woman that kills bad guys. Which character – as performed by John Rubinstein – was your favorite? John Rubinstein's performance was, as always, great. I liked his Jacob Lev. While I'm sure that the book was well written, and the concept of tying modern police drama to biblical times is interesting, since I was looking for an Alex Delaware type novel, this book left me disappointed to the point of anger at such an implausible conclusion (which really wasn't a conclusion). I'm sure there's an audience for this genre of book, and in that context this is probably a GREAT book, so I'd suggest that you make it more clear that this is NOT a story about real life police drama, but a fantasy novel that merges with police drama. Otherwise, many more people will be angry and disappointed. Harlan, PROMISE ME you will NEVER narrate AGAIN! My advice to anyone who has enjoyed listening to Scott Brick's narration of Harlan Coben's other Myron Bolitar novels is to take this opportunity to READ, rather than listen to, Promise Me! Coben's writing is almost as good as ever (although after 6 or 7 of them, they are becoming unneccessarily predictable), but why he chose to narrate this book is beyond comprehension. Unlike Scott Brick's amazing ability to equally bring voice to Latina lesbians or aging Mafia Dons, Coben seems to have two voices, his own and another that sounded like Yogi the Bear from the television cartoons of my youth. I kept expecting him to say "I'm smarter than the average Ranger, eh BoBo!". 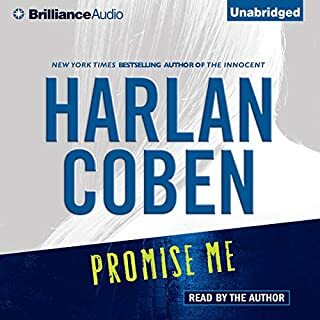 If and when there is a next Harlan Coben audible book, it had better have someone of Scott Brick's caliber narrating it if you want the public to purchase it! And Harlan, stick to writing!